Why Goats, Donkeys & Chickens? Please complete your donation by clicking the basket button above. Donations save lives.! Thirst in Africa is a daily threat. 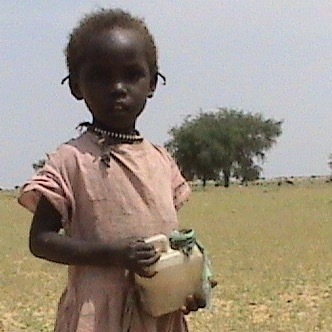 In Darfur, in the centre of Africa, where temperatures soar to over 50 degrees thirst can be a frightening reality. 2016 saw one of the worst droughts for many years across sub-Saharan Africa and in the villages of Darfur, when all surface water had long since dried up, there were many months when every drop of water had to be collected from miles across the open searingly hot desert. Many villagers, men, women, children and their animals, had to walk up to 20 miles for every drop. Can you imagine how elated everyone in Hillat Kharif, Amar Gadid, Azagarfa, Abu Degeise, Dor Fazy and Hillat Hassan are because they now have a Kids for Kids’ hand pump? – thanks to you. Sara is a grandmother. She has struggled all her life with the deprivations of living in Darfur. There are still many people without access to clean water to drink – they have to share Haffirs (artificial water holes) with animals. The result is that people, especially young children, are susceptible to water-borne diseases that can kill. Children can succumb quickly, the youngest first. They are even more vulnerable in years when malnutrition is endemic in every village. “If we cannot install a hand pump close to a village because it is impossible to drill, then we will fund watercarts, pulled by the stronger crossbred donkeys – anything to make that terrible walk for water easier” said Patricia Parker MBE Founder of Kids for Kids. with fun ways to donate! Please complete your donation by clicking your cart above! Subscribe to our latest news: Keep up to date with how we are turning lives around and what you can do to help! Copyright Kids For Kids © 1990 - 2019. A Company limited by Guarantee Registered in England & Wales No: 04607292.